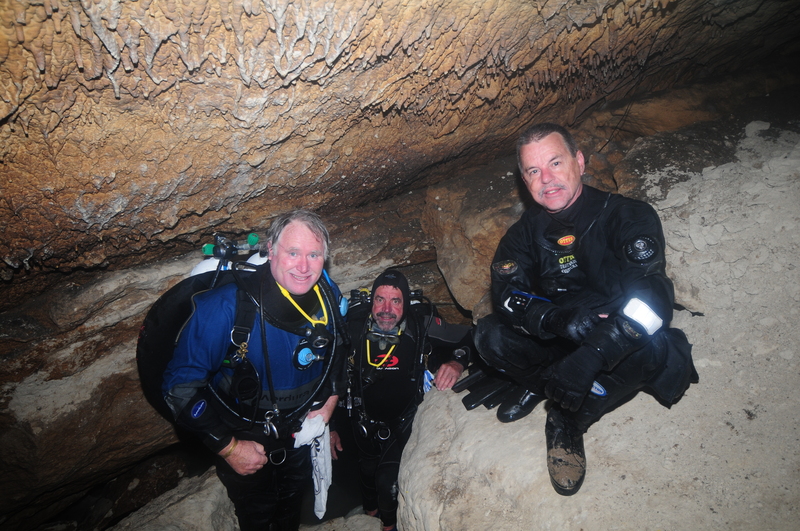 Terry Cummins; International VP of Marketing Metrics for PADI Worldwide, Warrick McDonald; AB Ocean Divers, PADI Course Director and Cave Divers Association of Australia officer and Russel Kitt; Oceanic Australia – all old mates and well known cave divers recently ventured to Australia’s famous Mount Gambier for a week of fantastic cave diving. Terry has dived Mount Gambier since the late 60s, dived many of the local sites, but had not until this trip, dived the famous “Tank Cave” with its 7 kilometres plus of known passages. Terry said: “this has to be one of the most fantastic cave diving sites in the world; gin clear water, varying levels of adventurous cave diving, squeezes, cathedrals and unlike some of the caves I dived elsewhere in the world – no currents to contend with – amazing! Tank is what cave diving is all about”. Other sites the team dived included; The Pines, One Tree, Little Blue, Ewens and Piccaninnie Ponds. PADI Instructor Rod Punshon of Pro Dive Cairns; one of the world’s most successful PADI dive stores, also joined the group for some of the dives and underwent preliminary cavern training. Rod loved the experience – a far cry from the coral caverns of the Great Barrier Reef that he has in his back yard. Rod will return to Mount Gambier in the future to seek a higher CDAA and the new PADI Cave rating so he can access a wider range of sites and experience some of the more challenging dives. Terry said “it was great to see a guy that has done so much diving, but not ventured into cave diving, take such an immediate shine to the experience. He is hooked”. Next PostNext Who needs the Oriskany?